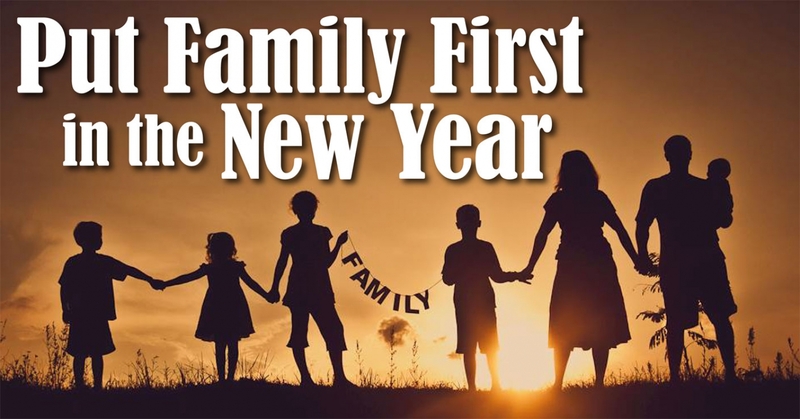 Ten tips for putting family first in the new year. Between being a child psychologist for 25-plus years and a dad of three children for more than 15 years, I am immersed in child and family issues. Drawing from research in the field and personal experience, the following strategies should help busy parents like you feel less frazzled and more available for your families. 1. Your time is the most generous gift you can give your kid, so invest one hour each week in undivided one-on-one time. During this time try to do nothing else but pay attention to your child and offer positive thoughts or feelings. This makes one-on-one moments different from quality time where a parent might also be doing an activity that demands his attention. 2. Discover what your child excels at and give your youngster regular opportunities to thrive. Assuming normal brain functioning, everyone excels at something (my experience suggests at least two or three things). A kid on display for utilizing top strengths— especially when the strengths entertain or serve others— fosters a healthy self-esteem. A healthy self-esteem is to a child’s psyche what Captain America’s shield was to the superhero. 3. Place a high priority on creating and maintaining weekly, seasonal and special occasion rituals. From a child’s perspective: Planes may be crashing into buildings, bullies may be shooting kids in schools, hurricanes may be knocking down towns, but we still should have pizza night or go out to eat on birthdays. Rituals are islands of stability in the torrential currents of our culture. 4. Ensure your child sleeps enough, gets an hour a day of physical activity and eats a healthy diet. Our nation is experiencing an epidemic of sleep deprivation. Take note of this sleep guide: Kids ages 1-3 should get 12-14 hours of sleep, ages 3-5 should get 11-13 hours, ages 5-12 should get 10-11 hours and teens should get 8.5-9.25 hours. Moreover, overseeing that kids spend an hour each day sweating and breathing hard, which can be experienced during fun family activities, is as crucial to a child’s mental and physical health as daily flossing is to the child’s dental health. The same thing goes for staying away from processed foods and sticking to a diet advised by your child’s pediatrician or nutritionist. 5. Treat your self-care and your relationship with your significant other as top priorities. Flight attendants give great parenting advice when teaching adults traveling with children how to handle oxygen masks. But many households are going down in flames, figuratively speaking, and all of the oxygen is going to the children. Caring for yourself and your personal relationships in turn helps our kids. 6. Strive to establish harmony and collaboration with the adults outside of your home who are important figures in your child’s life. A child experiences the ripples of discord and disengagement just as a child experiences the ripples of harmony and collaboration. We simply haven’t the power to allow access to one type of ripple and block the other. 7. Give your child regular opportunities to broaden his capacity to do things, especially when your child doesn’t feel like it. The strength of this psychological muscle best predicts success in our culture. Show me someone who does something only when he or she feels like it and I’ll show you a half-baked outcome at best. This is true across all human endeavors. 8. Limit your child’s time with sedentary electronic pleasures to two hours a day and monitor such activity to confirm that your child isn’t being exposed to potentially harmful material or situations. If a child is plugged in for longer than this, the odds increase that the child is missing out on important engagements, such as physical activity, academic work and extracurricular pursuits. Besides, if we are not monitoring our child, it’s likely no one else is either. 9. Teach your child the truth behind this formula: crisis = (pain/2) + (opportunity/2). Once pain is given its due, it offers treasures, assuming a person is looking for them. Learning this bolsters your child’s resilience. Also, we need to remember that as engaged parents, we are no happier than our least happy child. When our kids hurt, we hurt worse. For this reason, we sometimes unintentionally deprive our children of the value of developmentally appropriate failure and suffering. 10. Inform your child that his mood is influenced more by what he thinks about what has happened than what has actually happened. Research suggests that only about 10 percent of our happiness is attributable to life’s actual circumstances. But truthful thinking is effective thinking. Related skills can be taught. I suggest learning some methods for accomplishing this yourself and then teaching them to your child.